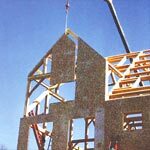 Structural Insulated Panels (SIPs): High-performance building panels for walls, roofs and floors typically made with expanded polystyrene (EPS) rigid foam insulation sandwiched between two structural skins of oriented strand board (OSB), or other surface types. Nailbase: Ideal insulation and nailbase surface for roofing and walls. Nailbase is made of expanded polystyrene (EPS) rigid foam insulation and one outer layer of OSB, or other surface type. 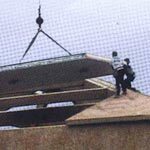 Insulated Roof Panels: Building panels of various forms with an OSB top facer that allows shingles, shakes, metal or other roofing materials to be attached. 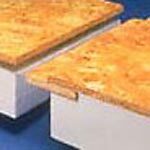 EPS insulation core provides stable, high R-value insulation.